After a long night of making deliveries, Santa made one last stop at St. Peter’s Hospital on Christmas Day before heading back to the North Pole. 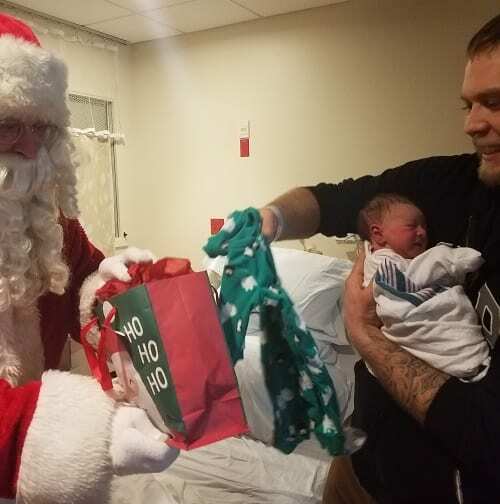 Old St. Nick visited happy moms and families – and brought a gift for their newest arrivals – in their hospital rooms at the St. Peter’s Hospital Hearst Family Center. Santa also made sure to get his flu vaccination before leaving the North Pole and making his rounds, thus providing extra protection to the newborns and their mothers and complying with state regulations requiring vaccination of health care personnel. Click here to see a video of Santa’s visit. St. Peter’s Hospital, an affiliate of St. Peter’s Health Partners, is the first hospital in the Capital Region to earn the international “Baby-Friendly” designation. It is one of only three hospitals in Upstate New York and among 387 hospitals and birth center across the United States to hold the Baby-Friendly designation. In 2017, approximately 2,950 babies were delivered at St. Peter’s Hospital. For more information about delivering a baby at St. Peter’s Hospital, please click here.